Took one sip and had to force myself to take another. Only one person in our group could tolerate it after it got watered down by the ice. Tasted like pure pickle juice with A1 mixed in to me. Would not order another one from here. Nasty!!!!! $6 for a lime wedge with all Vodka and no Flavor!!!!! Ugh! 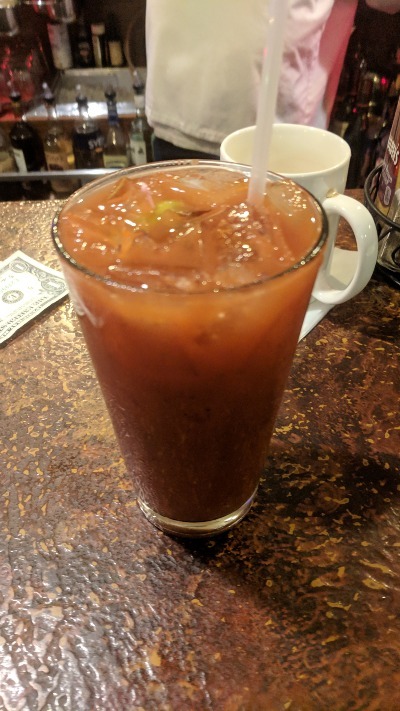 one of the worst bloodies Ive ever experienced. NO salad bar.. just a lemon wedge... and it was 90% vodka. awful. then it cost 6.00! Not a great bloody... little spice, maybe a shot and a half of rail vodka, and only an olive. Pretty dissapointing overall. I was a bit disappointed in this one. Not much spice - even when I asked to spice up the second one I had. Salad was limited to an olive and lemon slice. The breakfast was great though!